This article is about the Mexican holiday. For other uses, see Day of the Dead (disambiguation). The Day of the Dead (Spanish: Día de Muertos) is a Mexican holiday celebrated throughout Mexico, in particular the Central and South regions, and by people of Mexican heritage elsewhere. The multi-day holiday focuses on gatherings of family and friends to pray for and remember friends and family members who have died, and help support their spiritual journey. In the Mexican culture death is viewed has a natural part of the human cycle. They view it has a day of celebration, they believe their loved ones awake and celebrate with them. They don't view it as a day of sadness but as a day of celebration. In 2008, the tradition was inscribed in the Representative List of the Intangible Cultural Heritage of Humanity by UNESCO. The holiday is sometimes called Día de los Muertos in Anglophone countries, a back-translation of its original name, Día de Muertos. It is particularly celebrated in Mexico where the day is a public holiday. Prior to Spanish colonization in the 16th century, the celebration took place at the beginning of summer. Gradually, it was associated with October 31, November 1, and November 2 to coincide with the Western Christianity triduum of Allhallowtide: All Saints' Eve, All Saints' Day, and All Souls' Day. Traditions connected with the holiday include building private altars called ofrendas, honoring the deceased using calaveras, aztec marigolds, and the favorite foods and beverages of the departed, and visiting graves with these as gifts. Visitors also leave possessions of the deceased at the graves. Originally, the Day of the Dead as such was not celebrated in northern Mexico, where it was unknown until the 20th century because its indigenous people had different traditions. The people and the church rejected it as a day related to syncretizing pagan elements with Catholic Christianity. They held the traditional 'All Saints' Day' in the same way as other Christians in the world. There was limited Mesoamerican influence in this region, and relatively few indigenous inhabitants from the regions of Southern Mexico, where the holiday was celebrated. In the early 21st century in northern Mexico, Día de Muertos is observed because the Mexican government made it a national holiday based on educational policies from the 1960s; it has introduced this holiday as a unifying national tradition based on indigenous traditions. The Mexican Day of the Dead celebration is similar to other societies' observances of a time to honor the dead. The Spanish tradition know as 'All Saints Day' celebrates in similar ways, for instance they celebrate with festivals and parades, as well as gatherings of families at cemeteries to pray for their deceased loved ones at the end of the day. The Day of the Dead celebrations in Mexico developed from ancient traditions among its pre-Columbian cultures. Rituals celebrating the deaths of ancestors had been observed by these civilizations perhaps for as long as 2,500–3,000 years. The festival that developed into the modern Day of the Dead fell in the ninth month of the Aztec calendar, about the beginning of August, and was celebrated for an entire month. The festivities were dedicated to the goddess known as the "Lady of the Dead", corresponding to the modern La Calavera Catrina. By the late 20th century in most regions of Mexico, practices had developed to honor dead children and infants on November 1, and to honor deceased adults on November 2. 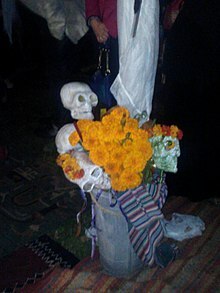 November 1 is generally referred to as Día de los Inocentes ("Day of the Innocents") but also as Día de los Angelitos ("Day of the Little Angels"); November 2 is referred to as Día de los Muertos or Día de los Difuntos ("Day of the Dead"). In the 2015 James Bond film, Spectre, the opening sequence features a Day of the Dead parade in Mexico City. At the time, no such parade took place in Mexico City; one year later, due to the interest in the film and the government desire to promote the pre-Hispanic Mexican culture, the federal and local authorities decided to organize an actual "Día de Muertos" parade through Paseo de la Reforma and Centro Historico on October 29, 2016, which was attended by 250,000 people. 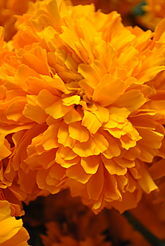 Mexican cempasúchil (marigold) is the traditional flower used to honor the dead. Plans for the day are made throughout the year, including gathering the goods to be offered to the dead. During the three-day period families usually clean and decorate graves; most visit the cemeteries where their loved ones are buried and decorate their graves with ofrendas (altars), which often include orange Mexican marigolds (Tagetes erecta) called cempasúchil (originally named cempoaxochitl, Nāhuatl for "twenty flowers"). In modern Mexico the marigold is sometimes called Flor de Muerto (Flower of Dead). These flowers are thought to attract souls of the dead to the offerings. It is also believed the bright petals with a strong scent can guide the souls from cemeteries to their family homes. Toys are brought for dead children (los angelitos, or "the little angels"), and bottles of tequila, mezcal or pulque or jars of atole for adults. Families will also offer trinkets or the deceased's favorite candies on the grave. Some families have ofrendas in homes, usually with foods such as candied pumpkin, pan de muerto ("bread of dead"), and sugar skulls; and beverages such as atole. The ofrendas are left out in the homes as a welcoming gesture for the deceased. 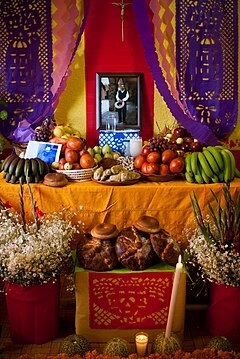 Some people believe the spirits of the dead eat the "spiritual essence" of the ofrendas food, so though the celebrators eat the food after the festivities, they believe it lacks nutritional value. Pillows and blankets are left out so the deceased can rest after their long journey. In some parts of Mexico, such as the towns of Mixquic, Pátzcuaro and Janitzio, people spend all night beside the graves of their relatives. In many places, people have picnics at the grave site, as well. Some families build altars or small shrines in their homes; these sometimes feature a Christian cross, statues or pictures of the Blessed Virgin Mary, pictures of deceased relatives and other people, scores of candles, and an ofrenda. Traditionally, families spend some time around the altar, praying and telling anecdotes about the deceased. In some locations, celebrants wear shells on their clothing, so when they dance, the noise will wake up the dead; some will also dress up as the deceased. Those with a distinctive talent for writing sometimes create short poems, called calaveras (skulls), mocking epitaphs of friends, describing interesting habits and attitudes or funny anecdotes. This custom originated in the 18th or 19th century after a newspaper published a poem narrating a dream of a cemetery in the future, "and all of us were dead", proceeding to read the tombstones. 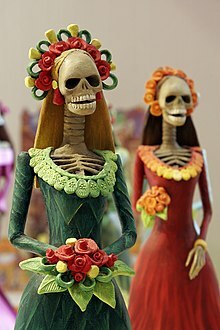 Newspapers dedicate calaveras to public figures, with cartoons of skeletons in the style of the famous calaveras of José Guadalupe Posada, a Mexican illustrator. Theatrical presentations of Don Juan Tenorio by José Zorrilla (1817–1893) are also traditional on this day. A common symbol of the holiday is the skull (in Spanish calavera), which celebrants represent in masks, called calacas (colloquial term for skeleton), and foods such as sugar or chocolate skulls, which are inscribed with the name of the recipient on the forehead. Sugar skulls can be given as gifts to both the living and the dead. Other holiday foods include pan de muerto, a sweet egg bread made in various shapes from plain rounds to skulls and rabbits, often decorated with white frosting to look like twisted bones. In contrast, the town of Ocotepec, north of Cuernavaca in the State of Morelos, opens its doors to visitors in exchange for veladoras (small wax candles) to show respect for the recently deceased. In return the visitors receive tamales and atole. This is done only by the owners of the house where someone in the household has died in the previous year. Many people of the surrounding areas arrive early to eat for free and enjoy the elaborate altars set up to receive the visitors. In some parts of the country (especially the cities, where in recent years other customs have been displaced) children in costumes roam the streets, knocking on people's doors for a calaverita, a small gift of candies or money; they also ask passersby for it. This relatively recent custom is similar to that of Halloween's trick-or-treating in the United States. Another peculiar tradition involving kids is La Danza de los Viejitos (the dance of the old men) when boy and young men dressed as granpas crouch and then jump in an energetic dance. During Day of the Dead festivities, food is both eaten by living people and given to the spirits of their departed ancestors as ofrendas ("offerings"). Tamales are one of the most common dishes prepared for this day for both purposes. Pan de muerto and calaveras are associated specifically with Day of the Dead. Pan de muerto is a type of sweet roll shaped like a bun, topped with sugar, and often decorated with bone-shaped phalanges pieces. Calaveras, or sugar skulls, display colorful designs to represent the vitality and individual personality of the departed. In addition to food, drink is also important to the tradition of Day of the Dead. Historically, the main alcoholic drink was pulque while today families will commonly drink the favorite beverage of their deceased ancestors. Other drinks associated with the holiday are atole and champurrado, warm, thick, non-alcoholic masa drinks. Jamaican iced tea is a popular herbal tea made of the flowers and leaves of the Jamaican hibiscus plant (Hibiscus sabdariffa), known as flor de Jamaica in Mexico. It is served cold and quite sweet with a lot of ice. The ruby-red beverage is called hibiscus tea in English-speaking countries and called agua de Jamaica (water of Jamaica) in Spanish. In Belize, Day of the Dead is practiced by people of the Yucatec Maya ethnicity. The celebration is known as Hanal Pixan which means "food for the souls" in their language. Altars are constructed and decorated with food, drinks, candies, and candles put on them. Día de las Ñatitas ("Day of the Skulls") is a festival celebrated in La Paz, Bolivia, on May 5. In pre-Columbian times indigenous Andeans had a tradition of sharing a day with the bones of their ancestors on the third year after burial. Today families keep only the skulls for such rituals. Traditionally, the skulls of family members are kept at home to watch over the family and protect them during the year. On November 9, the family crowns the skulls with fresh flowers, sometimes also dressing them in various garments, and making offerings of cigarettes, coca leaves, alcohol, and various other items in thanks for the year's protection. The skulls are also sometimes taken to the central cemetery in La Paz for a special Mass and blessing. The Brazilian public holiday of Finados (Day of the Dead) is celebrated on November 2. Similar to other Day of the Dead celebrations, people go to cemeteries and churches with flowers and candles and offer prayers. The celebration is intended as a positive honoring of the dead. Memorializing the dead draws from indigenous, African and European Catholic origins. Guatemalan celebrations of the Day of the Dead, on November 1, are highlighted by the construction and flying of giant kites in addition to the traditional visits to grave sites of ancestors. A big event also is the consumption of fiambre, which is made only for this day during the year. In Ecuador the Day of the Dead is observed to some extent by all parts of society, though it is especially important to the indigenous Kichwa peoples, who make up an estimated quarter of the population. Indigena families gather together in the community cemetery with offerings of food for a day-long remembrance of their ancestors and lost loved ones. Ceremonial foods include colada morada, a spiced fruit porridge that derives its deep purple color from the Andean blackberry and purple maize. This is typically consumed with guagua de pan, a bread shaped like a swaddled infant, though variations include many pigs—the latter being traditional to the city of Loja. The bread, which is wheat flour-based today, but was made with masa in the pre-Columbian era, can be made savory with cheese inside or sweet with a filling of guava paste. These traditions have permeated mainstream society, as well, where food establishments add both colada morada and gaugua de pan to their menus for the season. Many non-indigenous Ecuadorians visit the graves of the deceased, cleaning and bringing flowers, or preparing the traditional foods, too. In many American communities with Mexican residents, Day of the Dead celebrations are very similar to those held in Mexico. In some of these communities, in states such as Texas, New Mexico, and Arizona, the celebrations tend to be mostly traditional. The All Souls Procession has been an annual Tucson, Arizona event since 1990. The event combines elements of traditional Day of the Dead celebrations with those of pagan harvest festivals. People wearing masks carry signs honoring the dead and an urn in which people can place slips of paper with prayers on them to be burned. Likewise, Old Town San Diego, California annually hosts a traditional two-day celebration culminating in a candlelight procession to the historic El Campo Santo Cemetery. The festival also is held annually at historic Forest Hills Cemetery in Boston's Jamaica Plain neighborhood. Sponsored by Forest Hills Educational Trust and the folkloric performance group La Piñata, the Day of the Dead festivities celebrate the cycle of life and death. People bring offerings of flowers, photos, mementos, and food for their departed loved ones, which they place at an elaborately and colorfully decorated altar. A program of traditional music and dance also accompanies the community event. The Smithsonian Institution, in collaboration with the University of Texas at El Paso and Second Life, have created a Smithsonian Latino Virtual Museum and accompanying multimedia e-book: Día de los Muertos: Day of the Dead. The project's website contains some of the text and images which explain the origins of some of the customary core practices related to the Day of the Dead, such as the background beliefs and the offrenda (the special altar commemorating one's deceased loved one). The Made For iTunes multimedia e-book version provides additional content, such as further details; additional photo galleries; pop-up profiles of influential Latino artists and cultural figures over the decades; and video clips of interviews with artists who make Día de Muertos-themed artwork, explanations and performances of Aztec and other traditional dances, an animation short that explains the customs to children, virtual poetry readings in English and Spanish. Santa Ana, California is said to hold the "largest event in Southern California" honoring Día de Muertos, called the annual Noche de Altares, which began in 2002. The celebration of the Day of the Dead in Santa Ana has grown to two large events with the creation of an event held at the Santa Ana Regional Transportation Center for the first time on November 1, 2015. In other communities, interactions between Mexican traditions and American culture are resulting in celebrations in which Mexican traditions are being extended to make artistic or sometimes political statements. For example, in Los Angeles, California, the Self Help Graphics & Art Mexican-American cultural center presents an annual Day of the Dead celebration that includes both traditional and political elements, such as altars to honor the victims of the Iraq War, highlighting the high casualty rate among Latino soldiers. An updated, intercultural version of the Day of the Dead is also evolving at Hollywood Forever Cemetery. There, in a mixture of Native Californian art, Mexican traditions and Hollywood hip, conventional altars are set up side-by-side with altars to Jayne Mansfield and Johnny Ramone. Colorful native dancers and music intermix with performance artists, while sly pranksters play on traditional themes. Similar traditional and intercultural updating of Mexican celebrations are held in San Francisco. For example, the Galería de la Raza, SomArts Cultural Center, Mission Cultural Center, de Young Museum and altars at Garfield Square by the Marigold Project. Oakland is home to Corazon Del Pueblo in the Fruitvale district. Corazon Del Pueblo has a shop offering handcrafted Mexican gifts and a museum devoted to Day of the Dead artifacts. Also, the Fruitvale district in Oakland serves as the hub of the Día de Muertos annual festival which occurs the last weekend of October. Here, a mix of several Mexican traditions come together with traditional Aztec dancers, regional Mexican music, and other Mexican artisans to celebrate the day. As part of a promotion by the Mexican embassy in Prague, Czech Republic, since the late 20th century, some local citizens join in a Mexican-style Day of the Dead. A theatre group produces events featuring masks, candles, and sugar skulls. Mexican-style Day of the Dead celebrations occur in major cities in Australia, Fiji, and Indonesia. Additionally, prominent celebrations are held in Wellington, New Zealand, complete with altars celebrating the deceased with flowers and gifts. In the Philippines "Undás", "Araw ng mga Yumao" (Tagalog, Day of those who have passed away), coincides with the Roman Catholic's celebration of All Saint's Day and continues on to the following day of All Soul's Day. Filipinos traditionally observe this day by visiting the family dead to clean and repair their tombs. Offerings of prayers, flowers, candles, and even food, while Chinese Filipinos additionally burn joss sticks and kim. Many also spend the day and ensuing night holding reunions at the cemetery, having feasts and merriment. ^ Society, National Geographic (October 17, 2012). "Dia de los Muertos". National Geographic Society. Retrieved April 8, 2019. ^ "Indigenous festivity dedicated to the dead". UNESCO. Archived from the original on October 11, 2014. Retrieved October 31, 2014. ^ "Dia de los Muertos". El Museo del Barrio. Archived from the original on October 27, 2015. Retrieved October 31, 2015. ^ "Austin Days of the Dead". Archived from the original on November 1, 2015. Retrieved October 31, 2015. ^ a b Day, Frances Ann (2003). Latina and Latino Voices in Literature. Greenwood Publishing Group. p. 72. ISBN 978-0313323942. ^ Lumaban, Weely A. (October – November 2008). "All Soul's Day". The Bread Basket. Vol. V no. 3. Rex Bookstore, Inc. pp. 23–23. ^ "Dia de los Muertos". National Geographic Society. Archived from the original on November 2, 2016. Retrieved November 2, 2016. ^ Lee, Stacy (2002). Mexico and the United States. Marshall Cavendish. ISBN 0761474021. ^ Cazares, Eduardo (November 2, 2015). "Día de Muertos en Nuevo León". Diario Cultura. Diario Cultura.mx. Archived from the original on November 1, 2014. Retrieved November 1, 2014. ^ Mendoza, Gustavo. "Hasta en el velorio, las penas con pan son menos". Milenio. Archived from the original on October 25, 2016. Retrieved November 1, 2014. ^ "Dia de Todos los Santos: All Saints' Day in Spain". don Quijote. Ideal Education Group S.L. Archived from the original on September 29, 2017. Retrieved September 29, 2017. ^ Miller, Carlos (2005). "History: Indigenous people wouldn't let 'Day of the Dead' die". The Arizona Republic. Day of the Dead – Día De Los Muertos. Retrieved November 28, 2007. ^ a b c d Salvador, R.J. (2003). John D. Morgan and Pittu Laungani (ed.). Death and Bereavement Around the World: Death and Bereavement in the Americas. Death, Value and Meaning Series, Vol. II. Amityville, New York: Baywood Publishing Company. pp. 75–76. ISBN 0-89503-232-5. ^ a b Palfrey, Dale Hoyt (1995). "The Day of the Dead". Día de los Muertos Index. Access Mexico Connect. Archived from the original on November 30, 2007. Retrieved November 28, 2007. ^ "Mexico City stages first Day of the Dead parade". BBC. October 29, 2016. Archived from the original on October 30, 2016. Retrieved November 1, 2016. ^ "Fotogalería: Desfile por Día de Muertos reúne a 250 mil personas". Excélsior (in Spanish). October 29, 2016. Archived from the original on October 31, 2016. Retrieved November 1, 2016. ^ "Galerías Archivo". Televisa News. Archived from the original on November 3, 2016. Retrieved November 1, 2016. ^ "5 Facts About Día de los Muertos (The Day of the Dead)". Smithsonian Insider. October 30, 2016. Archived from the original on August 29, 2018. Retrieved August 29, 2018. ^ "Día de los Muertos or Day of the Dead". Archived from the original on August 29, 2018. Retrieved August 29, 2018. ^ Turim, Gayle (November 2, 2012). "Day of the Dead Sweets and Treats". History Stories. History Channel. Archived from the original on June 6, 2015. Retrieved July 1, 2015. ^ a b c Godoy, Maria. "Sugar Skulls, Tamales And More: Why Is That Food On The Day Of The Dead Altar?". NPR. Archived from the original on October 28, 2017. Retrieved October 25, 2017. ^ Castella, Krystina (October 2010). "Pan de Muerto Recipe". Epicurious. Archived from the original on July 8, 2015. Retrieved July 7, 2015. ^ "Jamaica iced tea". Cooking in Mexico. Archived from the original on November 4, 2011. Retrieved October 23, 2011. ^ Guidi, Ruxandra (November 9, 2007). "Las Natitas". BBC. Archived from the original on December 6, 2008. ^ Smith, Fiona (November 8, 2005). "Bolivians Honor Skull-Toting Tradition". Associated Press. Archived from the original on February 18, 2008. Retrieved December 30, 2007. ^ "All Saints day in Bolivia – "The skull festival"". Bolivia Line (May 2005). Archived from the original on October 23, 2008. Retrieved December 20, 2007. ^ Burlingame, Betsy; Wood, Joshua. "Visit to cemetery in Guatemala". Expatexchange.com. Archived from the original on October 14, 2007. Retrieved August 13, 2009. ^ Ortiz, Gonzalo (October 30, 2010). "Diversity in Remembering the Dead". InterPress Service News Agency. Archived from the original on November 4, 2010. Retrieved October 30, 2010. ^ "Perú: así se vivió Día de todos los santos en cementerios de Lima". Peru. peru.com. January 1, 2016. Archived from the original on November 7, 2017. Retrieved October 30, 2017. ^ Wise, Danno. "Port Isabel's Day of the Dead Celebration". Texas Travel. About.com. Archived from the original on December 9, 2007. Retrieved November 28, 2007. ^ "Dia de los Muertos". visitalbuquerque.org. Archived from the original on November 3, 2016. Retrieved November 1, 2016. ^ Hedding, Judy. "Day of the Dead". Phoenix. About.com. Archived from the original on December 11, 2007. Retrieved November 28, 2007. ^ White, Erin (November 5, 2006). "All Souls Procession". Arizona Daily Star. Archived from the original on November 6, 2012. Retrieved November 28, 2007. ^ "Old Town San Diego's Dia de los Muertos". Archived from the original on November 7, 2014. Retrieved October 19, 2014. ^ Smithsonian Latino Virtual Museum. Día de los Muertos: Day of the Dead (Version 1.2 ed.). Archived from the original on December 22, 2014. Retrieved October 31, 2014. ^ "Smithsonian Latino Virtual Museum". Ustream. Archived from the original on October 31, 2014. Retrieved October 31, 2014. ^ Smithsonian Latino Virtual Museum. "Day of the Dead". Theater of the Dead. Archived from the original on November 12, 2014. Retrieved October 31, 2014. ^ Smithsonian Institution. "Smithsonian-UTEP Día de los Muertos Festival: A 2D and 3D Experience!". Smithsonian Latino Virtual Museum Press Release. Archived from the original on November 6, 2009. ^ "Less-scary holiday: Some faith groups offer alternatives to Halloween trick-or-treating". The Orange County Register. Archived from the original on October 31, 2015. Retrieved November 2, 2015. ^ "Viva la Vida or Noche de Altares? Santa Ana's downtown division fuels dueling Day of the Dead events". The Orange County Register. Archived from the original on November 3, 2015. Retrieved November 2, 2015. ^ "Making a night of Day of the Dead" Los Angeles Times October 18, 2006. Retrieved November 26, 2006. ^ "Dia de los Muertos [Day of the Dead] – San Francisco". Archived from the original on October 17, 2014. Retrieved October 19, 2014. ^ Elliott, Vicky (October 27, 2000). "Lively Petaluma festival marks Day of the Dead". The San Francisco Chronicle. Archived from the original on July 8, 2012. Retrieved August 6, 2010. ^ Day of the Dead in Prague Archived October 24, 2007, at the Wayback Machine, Radio Czech. ^ "Day of the Dead in Wellington, New Zealand". Scoop.co.nz. October 27, 2007. Archived from the original on June 4, 2009. Retrieved August 13, 2009. ^ ""All Saints Day around the world", Guardian Weekly, November 1, 2010". Archived from the original on October 29, 2018. Retrieved October 30, 2018. 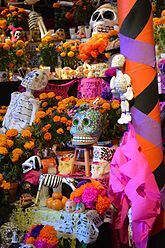 Wikimedia Commons has media related to Day of the Dead. Anguiano, Mariana, et al. Las tradiciones de Día de Muertos en México. Mexico City 1987. Brandes, Stanley (1997). "Sugar, Colonialism, and Death: On the Origins of Mexico's Day of the Dead". Comparative Studies in Society and History. 39 (2): 270–99. doi:10.1017/S0010417500020624. Brandes, Stanley (1998). "The Day of the Dead, Halloween, and the Quest for Mexican National Identity". Journal of American Folklore. 442: 359–80. doi:10.2307/541045. Brandes, Stanley (1998). "Iconography in Mexico's Day of the Dead". Ethnohistory. Duke University Press. 45 (2): 181–218. doi:10.2307/483058. Brandes, Stanley (December 15, 2006). Skulls to the Living, Bread to the Dead. Blackwell Publishing. p. 232. ISBN 1-4051-5247-8. Conklin, Paul (2001). "Death Takes a Holiday". U.S. Catholic. 66: 38–41. Garcia-Rivera, Alex (1997). "Death Takes a Holiday". U.S. Catholic. 62: 50. Lane, Sarah and Marilyn Turkovich, Días de los Muertos/Days of the Dead. Chicago 1987. Nutini, Hugo G. Todos Santos in Rural Tlaxcala: A Syncretic, Expressive, and Symbolic Analysis of the Cult of the Dead. Princeton 1988. Oliver Vega, Beatriz, et al. The Days of the Dead, a Mexican Tradition. Mexico City 1988. Roy, Ann (1995). "A Crack Between the Worlds". Commonwealth. 122: 13–16.